Sagging Floor Repair Cost – Is There an Inexpensive Repair Option? Are you noticing your furniture leaning towards the center of the room or do your floors have excessive bounce? That might be a sign of foundation or water damage. Water can creep into your home through cracks in your basement or crawl space and cause major damage to your home’s support beams and floor joists. Damages include wood rot, mold, mildew, soil erosion, cracks, and more. Most sagging floors can be fixed relatively inexpensively! Water can cause the soil to erode under the concrete blocks in your crawl space, causing the support they provide to fail. With no support from the concrete blocks, the floor beam will begin to sag causing your floor to become uneven. With the installation of an I-Beam and jacks, you can prevent further sagging. 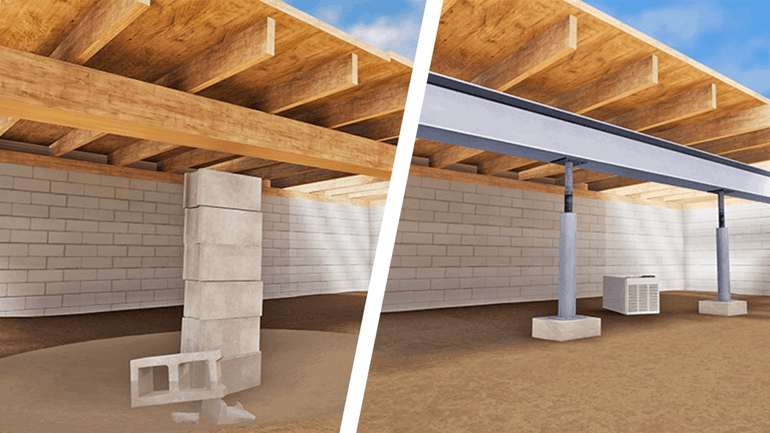 I-Beams supported with adjustable steel posts offer an easy, cost-effective solution in a crawl space. After installation, the system can be tightened and adjusted appropriately to secure, support, and sometimes lift the floor above. Jacks transfer a load of the house from the original weak or overloaded beams to metal beams. Steel is our first choice because it is more durable, stronger, cleaner, and faster to install than concrete beams. Acculevel uses 6″ I-Beams and a 12″ x 12″ pre-cast footing. Most competitors rely on a much smaller 8″ x 8″ footing and 4″ I-Beams. We use the very best materials to ensure a longer lasting repair with the best distribution of weight possible. I-Beam and Jacks are fully compatible with a crawl space encapsulation system. 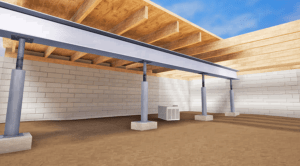 How are Jacks and I-Beams Installed? A steel I-Beam is cut an prepared to the correct size and installed where the old joist was. If there is not a sufficient footer for the jack to be placed on, a concrete block will be used. The jack is then assembled and tightened against the base of the steel i-beam. 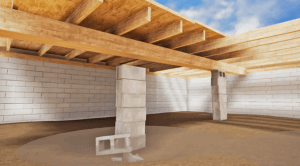 Crawl space floor support and floor joist repair costs vary greatly depending on the size of the structure and location of the trouble areas. Repairs typically begin with an $800 minimum. At Acculevel we can help give you the peace of mind you are looking for and get your home back in shape. Schedule an appointment today.